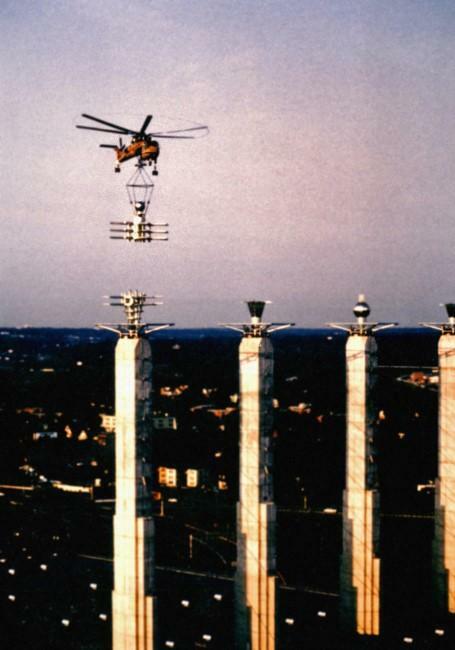 A helicopter places one of the ornaments on top of a pillar, more than 200 feet over Bartle Hall, in 1994. 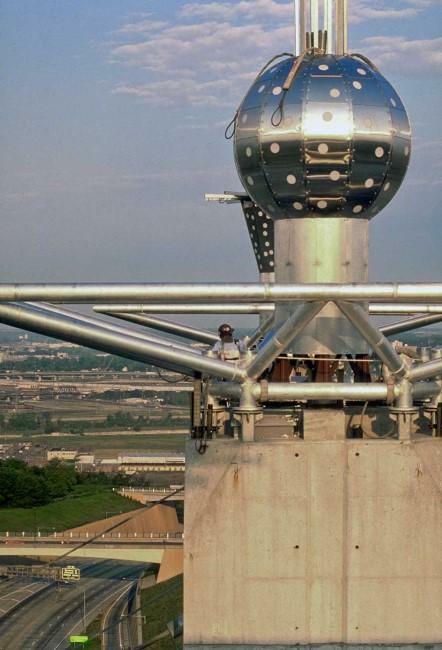 Sky Stations are the shiny, space-age sculptures on top of Bartle Hall (more commonly called "hair curlers"). 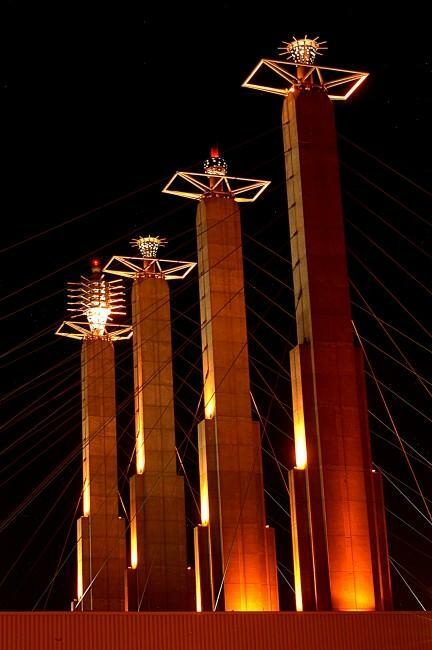 Twenty years ago this week, a helicopter hovered overhead to place the four steel and aluminum sculptures atop 300-foot concrete pylons in a public art installation that closed the downtown streets in Kansas City, Mo. What were your inspirations for Sky Stations? I started with the architect's design of the building. ... And the pylons stood out, of course, as one of the more prominent architectural features of a very original building, which was built like a bridge over the highway. That site inspired me to come up with a feature that would enhance what already was there, in terms of the architecture. Associated with the convention center, as you might know, is the Municipal Auditorium. And when I went into that building -- aside from the exterior, which is beautiful -- there are these magnificent lighting fixtures throughout the auditorium, Art Deco designs, extravagant, beautiful, optimistic. It seemed to me that was the clue right there, that I should be inspired by these fixtures and try to emulate them in a sculpture ... that could attach to the top of the pylons. So that's how the idea began. A worker stands next to one of the ornaments atop Bartle Hall. Were you in Kansas City for the installation? Yes, it was an amazing experience. The helicopter came in from the Northwest and was used for the logging industry, and previous to that, I believe it was used in Vietnam. It had to be flown in with its own oil truck. Basically, the helicopter had a 20-minute window of opportunity to pick the sculpture up and place it on the pylon. If that 20 minutes elapsed before that occurred, they basically would have had to drop the sculpture because the aircraft would no longer have enough fuel. There was a drama about it. And it was just very exciting. It was an amazing moment, I think, for everyone, not just me. Sky Stations has really become an iconic part of Kansas City's skyline. When televised sporting events are taking place in Kansas City, this is a really prominent feature. How do you feel when you see your work in this way? Well, obviously, it's very gratifying. And it was certainly an honor to be offered this opportunity to place something, you know, that eventually became a symbol for the city. R.M. Fischer's stainless steel sculptures also emanate light in a two-mile radius at night. I always hoped that the work would appear optimistic, and life-affirming, and celebratory and that it would be energizing, and all those things, I suppose, were embraced as something that was part of the work. And I think that sort of lent to it becoming symbolic. I also think the time that it was designed and built was a special time. Not just for Kansas City, but for public art in general. I think it was a time of risk taking. It was basically an urban renewal project for downtown Kansas City, which, like many American cities at the time, had emptied out into the suburbs. And the cities were trying to bring people back into the downtown. So the convention center was almost a symbol of that urban renewal. And the Sky Stations became part of that. And it took a life of its own. And that's part of why I think it became so special. That it was a kind of rebirth for the downtown. I think it was a once-in-a-lifetime project. And the building, too, is very special, the way it hovers over the highway, almost floating in space, as I hoped the Sky Stations would be. This week marks the 20th anniversary of its dedication and installation. What are your thoughts looking back? Well, it’s one of my proudest moments of my career and I'm continually reaching back and thinking of the moments, the experiences I had in Kansas City. On a personal level, I was embraced by everyone who I worked with and dealt with. There was just kind of a family atmosphere that I can't say has happened for me in any other project, and I've done projects across the country. This really was a family affair and will stay with me forever. And I hope Kansas City remains in love with the project and that it symbolizes something eternally for Kansas City.